Employers have implemented the new tax law's withholding rates so you may see a slight bump in your pay this month, if you haven't already. 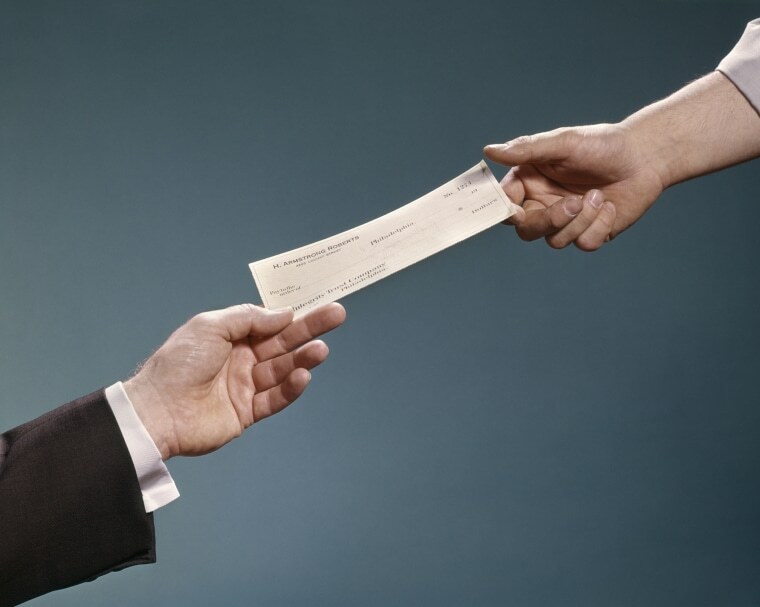 Notice a little extra cash in your most recent paycheck? It wasn't a glitch and provided nothing changes in your work or tax status, you can count on these slightly cushier amounts for the time being. It's all a result of the new tax bill and the IRS' revised withholding tables (which employers had until today to put into effect). "The IRS did it to make the least amount of difficulty so you don't have to do a new W-4; otherwise you'd have millions of people scrambling to fill out a new form and get them all out in a week or two," says Jackie Perlman, principal tax research analyst at The Tax Institute at H&R Block tells NBC News BETTER. "About 80 to 90 percent of people are getting an increase of about one to two percent," adds Jean Chatzky, a financial editor for NBC News. So, if you're making $56k a year (roughly the median household income for the U.S), you could be seeing around an extra thousand a year in your take-home pay (bear in mind, this all depends on your withholdings, so consult your HR department if you're unsure). The money is spread out over the year in each check, so it probably won’t look like a whole lot as it comes in, but as Chatzky says, it's enough to order another Blue Apron box. Still, there’s reason to be frugal. It’s not that this money isn’t yours (provided your tax forms are correct, you should be good to go); but this isn’t exactly a bonus, at least not for everyone when you look at the big picture. Most of Us Live Paycheck-to-Paycheck. This Is What It Does to Your Health. “One taxpayer may enjoy an actual lower tax bill, while another taxpayer may not see much benefit, if, say, she no longer can deduct the full cost of her property taxes,” says Andrea Coombes, an investing specialist at NerdWallet. The new tax bill allows you to deduct up to $10k of state and local taxes; previously you could deduct the full amount. Folks are also losing personal exemptions valued at $4,050 per taxpayer, spouse and dependent in 2017. For some. the new standard deduction of $12k (nearly doubled what it was) and other tax perks make it worth it, but it really depends on your situation. Chatzky recommends having the money moved automatically every two-weeks (or however often you get paid) directly into a savings account to keep it separate from your spending funds. "Behavioral finance teaches us that we are incredibly fast adapters." says Chatzky "Two paychecks in you don't want to be wondering how you ever lived on less." As of last fall the total household debt in this country topped $13 trillion, while as many as 78 percent of us are living paycheck to paycheck. If you’re one of the many stuck in this cycle, use this money to pay down debts and to build an emergency fund. Henderson also strongly recommends adding more to your 401(k) along with any other retirement plans, as he sees far too many taxpayers skimping in this area. Coombes recommends using a retirement calculator to see what you can afford. Behavioral finance teaches us that we are incredibly fast adapters. Two paychecks in you don't want to be wondering how you ever lived on less. The new tax plan lowers the cap for mortgage interest deductions on newly purchased homes. Whether this affects you or not, it’s a good idea to build a “home fund,” of some sort. Chatzy recommends making an additional payment on your mortgage (be sure and advise the lending company you’re paying down the principal of your loan). You may also want to put the money aside if you’re thinking about a job in another state as we can no longer make deductions associated with moves for our career. But even if you stay put, brace for more changes in 2019. This tax law is far from being totally sorted out. “The IRS expects to make further changes to withholding in 2019, says Eric Bronnenkant, CFP and CPA, head of tax at Betterment for Business. "They will work with the businesses to encourage workers to file new W-4 forms next year."